Our Thanksgiving ended up being pretty low key this year since the we were all sick. We were going to go to Oklahoma and spend the holiday with Katie and Spencer, but Monday Wen and Malea got sick. By Tuesday Kaidrei had joined them. It caught up to me just after Thanksgiving dinner and Brian is starting to get it now. Due to the change of plans, I ended up going shopping for a turkey and fixings on Wednesday. The stores were madhouses! No black Friday shopping for me. I got my fill trying to get the turkey. Just as I got done rolling out the rolls and putting them on pans, Malea came in the kitchen begging to help me. 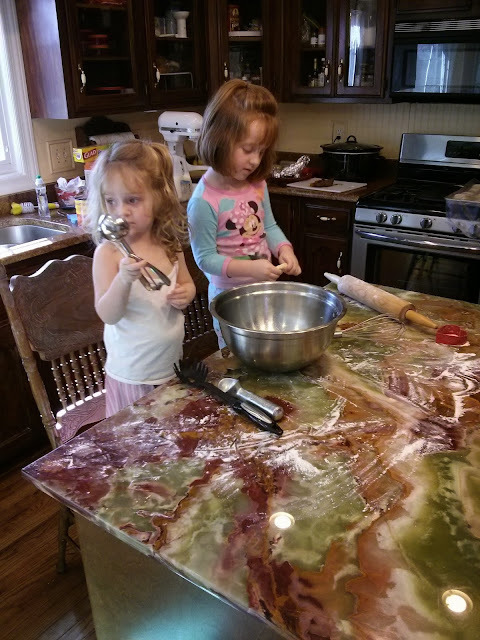 So I let her roll out the dough that was left. Before long Kaidrei had pushed the chair over to join her. 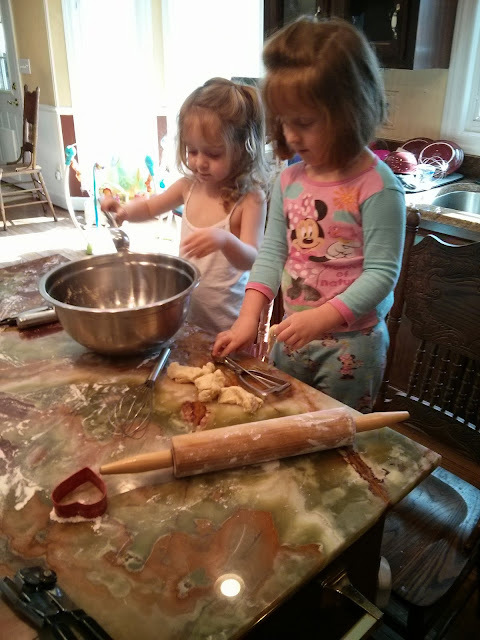 They spent a long time playing with the flour and dough and pulling more utensils out of the drawers by them. They were having so much fun taking turns pretending to be the baker and customer that I let them be as I fixed the other last minute things for the dinner. When we sat down to eat, we fixed them plates with a little bit of everything. Kaidrei declared that "this is the best dinner ever" as she ate her jello (apparently I need to make jello more often). Malea who hadn't been eating much because of being sick at the jello and the green beans. I was momentarily shocked when she asked for more beans since lately I've been struggling to get her to eat any vegetable...then I realized that we had beans from Grandma and Grandpa Yancey's garden and that is why she wanted more. I didn't realize how spoiled we were to have home canned beans, but it looks like this spring I will be trying to grow beans so that my kids will actually eat their vegetables.